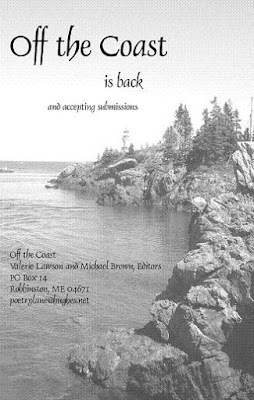 Following 13 years of successful publication under the editorship of George and Arlene Van Deventer, the poetry journal Off the Coast has found a new home in Downeast Maine. Valerie Lawson and Michael Brown, the new editors and publishers, are accepting submissions for the next issue until September 15th with publication scheduled for November 1st. the body of an e-mail. Postal submissions please include an SASE. dpi, approx. 2K pixels on the long side. 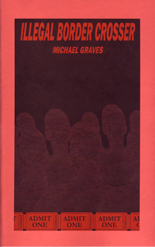 BOOKS for REVIEW: Send a single copy of a newly published poetry book for possible review. We are not accepting chapbooks for review at this time. additional copies of the issue in which their work appears for half price. four issues in 2009 are $50. Single issue: $10.